Please select a card type below for more information. 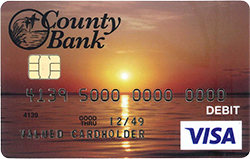 Your new County Bank Visa® Debit Card has an embedded chip that allows payment information to be securely transmitted at a chip-enabled terminal. This technology provides an enhanced level of security and greater worldwide acceptance. 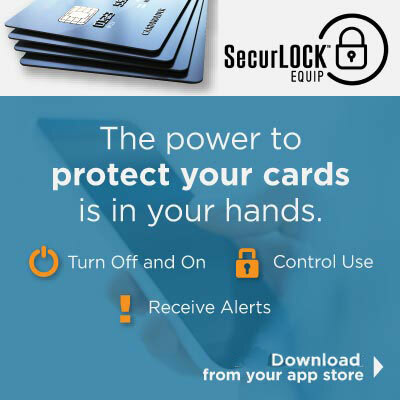 The chip technology provides stronger protection by making it difficult for your card to be copied or counterfeited at chip-enabled terminals as a unique code is created for each transaction. You can use your card at anywhere Visa® is accepted. In addition to using your card at chip-enabled terminals, your card has a magnetic stripe allowing you to use it at retailers who do not yet have chip-enabled terminals. How do I use my Debit Card at a retailer that is not yet chip-enabled. Your card is also equipped with magnetic stripe technology, so you can swipe your card like you do today at retailers that are not yet chip-enabled. For online or phone purchases, simply provide your card number and complete your transaction as you do today. Simply swipe your card, then press “Credit” and sign for your purchases or press “Debit” and enter your PIN, if necessary. Turn your debit card off and on, set alerts and view recent transactions. Why not leave the buying decisions in their hands? Visa® Gift Cards offer the gift of choice – they may be used anywhere Visa debit cards are accepted within the United States and countries considered to be U.S. territories. Convenient – May be used anywhere Visa debit cards are accepted within the United States and countries considered to be U.S. territories. Accessible – check balances online or by phone. Standard text message and data rates, fees, and charges may apply. County Bank Gift Cards provide you and your recipient with freedom and flexibility. Gift Cards are great to both give and receive. Useful for special occasions Gift Cards can also help you manage your spending. County Bank is pleased to offer Gift Cards as an additional option in our suite of products and services. Stop by any of our 7 convenient branch locations to purchase Gift Cards today. Gift Cards may only be purchased by County Bank customers at our branch locations. You may purchase Gift Cards in amounts from $10.00 to $1,000.00. Your card may be used anywhere Visa debit cards are accepted within the United States and countries considered to be U.S. territories. Your card can also be used for online and telephone purchases once the card has been registered. At point-of-sale, use your Gift Card as a signature based transaction. Select the “credit” option. You may obtain a Personalized Identification Number (PIN) by calling the number on the back of the Gift Card and following the automated instructions. After obtaining a PIN, you may select the “debit’’ option at point-of-sale. Your Gift Card cannot be used at ATMs or be used to obtain cash back in any purchase transaction. Your funds are FDIC insured if you simply register the Gift Card by visiting www.gocardservices.com or by calling 1-800-827-6227. You can also review balance and current transactions by logging into www.gocardservices.com or by calling 1-800-827-6227. Looking for a handy, flexible solution for managing the money you have and the money you’re spending? Look no further than a Visa® Reloadable Card. It’s easy to get control of your spending with the convenience of a County Bank Reloadable Visa Card. Just load your card and go. The Card is instant issued upon purchase for your immediate use and a personalized card will be mailed after your second reload. The County Bank Reloadable Visa Card can be used wherever Visa debit card are accepted excluding current OFAC sanctioned or prohibited countries. With monthly direct deposit reloads your Monthly Fee is waived. You can pay bills online, get ATM cash*, or use the card in stores. Make purchases online or over the phone. Your account is viewable by mobile device, online and you can set up text alerts**. Stop by any of our 7 convenient branch locations to purchase County Bank Reloadable Cards today. ATM Fees When you use an ATM, you may be charged a fee by third-parties to complete the transaction. Fee may include balance inquiry. County Bank Reloadable Cards may only be purchased by County Bank customers at our branch locations. You may initially purchase County Bank Reloadable Cards in amounts from $20.00 to $3,000.00. Your funds are FDIC insured upon registration. You may review balance and transaction history by logging into www.gocardservices.com or by calling 1-800-827-6227. Mobile remote check capture reloads are provided by the Ingo Money Network owned by Ingo Money, Inc. All checks are subject to approval for funding by Ingo™ at its sole discretion. Fees and other terms and conditions may apply. Visit http://ingomoney.com for more information about this service. The free Ingo™ Money app can be downloaded from the App Store ® or Google Play ™. *When you use an ATM you may be charged a fee to complete the transaction. This fee may include balance inquires. **Standard text message and data rates, fees and charges may apply. Applications for County Bank Visa® and MasterCard®credit cards are available at any of our 7 convenient branch locations. Stop by to speak with our branch representatives today. Local people. Local decisions. You may review balance and transaction history 24/7 by logging into www.mycardstatement.com, or by calling Card Holder Servicing at 1-800-423-7503. For LOCAL Customer Service call us at 226-9800.